"Our world has fallen still. One half lies drenched in eternal daylight, the other cloaked in endless night. All is light or darkness. All is the sun or the moon. All but me..."
The Moth Saga, a bestselling fantasy series, tells the story of Moth, a world torn in two--its one half always in sunlight, the other cloaked in endless night. 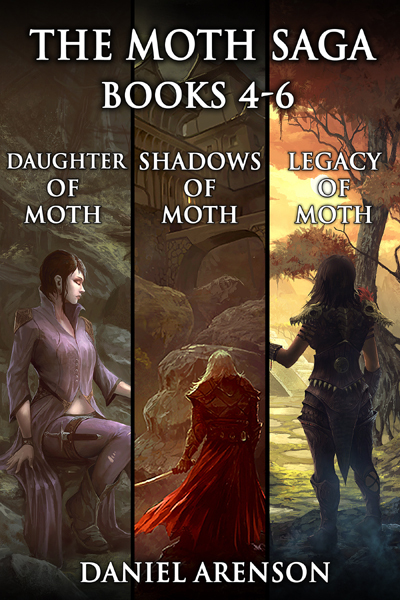 This bundle includes books four, five, and six in the series: Daughter of Moth, Shadows of Moth, and Legacy of Moth. Many eras ago, the world of Moth fell still, leaving one side in perpetual daylight, the other in darkness. Madori might be unique in Moth: her father is a son of sunlight, her mother a daughter of darkness. As war rages between Moth's two halves, Madori must find a way to heal this broken world . . . and to heal her own torn soul.